Itâ? ?s true that we generally send flowers, chocolates or presents to mark an occasion â?? as a way to say thanks, a way to say sorry, or a gesture of good faith. But really, life doesnâ? ?t need to present special circumstances for you to express how you feel about someone. Designerâ? ?s Collection I ($25.00 ON SALE): Take the worry out of selecting the perfect arrangement with our Designerâ? ?s Collection bouquet. Bloomexâ? ?s professional floral designers select and creatively arrange at least 15 stems of assorted flowers or a single type of flower. that's friendly on your wallet. Super Snapdragons($21.99): Snapdragons are a beloved flower, and this vibrant bouquet brings a ray of light in to any room. It includes 8 Snapdragons of assorted colours, complimented with fresh greens. Radiant Roses ($19.99): Itâ? ?s pretty hard to go wrong with red roses. 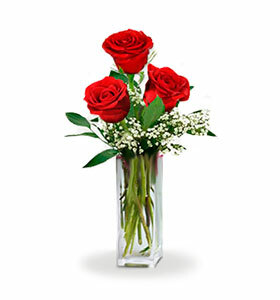 The Radiant Roses arrangement includes 3 extra long stemmed roses, adorned with Babyâ? ?s Breath and fresh greens. A simple, elegant way to let someone know youâ? ?re in their thoughts. Recipe for Romance ($34.95): This gorgeous bouquet features Cream Roses, White Spray Roses, Gladioli, Miniature White Carnations, Lisanthius and Waxflower. The soft colour palette of pink accented by white make this bouquet so elegant and beautiful. Crazy for You Bouquet ($39.95): Take some red roses, add some spray roses, white Alstroemeria and Pink Mini Carnations. Top it off with some assorted greenery, and youâ? ?ve got a winning recipe. The interplay between the red, pink and white make this bouquet a delicate, lovely choice to send to your significant other. Bestseller Bouquet ($59.99): A bestseller for a reason. This loaded bouquet features a white Gerbera Daisy, 6 Roses, 2 Spider Chrysanthemums, 3 Chrysanthemums, 4 Carnations, 2 Mini Carnations, a White Snapdragon and seasonal greens. 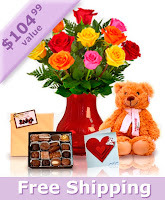 One of a Kind ($64.99): This package is a gorgeous assortment of presents, and youâ? ?ll pay much less than if youâ? ?d purchased each item individually. The One of a Kind package contains 12 Mixed Colour Long Stem Roses, a unique Ruby Red Vase, an adorable Teddy Bear and a Box of Premium Belgium truffles. To top it off, shipping is free between Tuesday and Friday provided you order a day in advance before 5 p.m.! Super Love Combo ($79.99): This package is an unbelievable value. 12 Mixed Long Stem Roses, a large box of premium chocolates, a coloured glass vase, teddy bear and a personalized card make this the perfect gift. And like the One of a Kind vase, shipping is free between Tuesday and Friday provided you order a day in advance before 5 p.m.
Want more gift ideas? We've got a page for that. Check out our 'Just Because' section on bloomex.ca by clicking here!